We always enjoy bringing readers details of new Kickstarter projects and today we’re looking at the SLiM stand that makes an iPad look like a mini iMac. We think this is a very neat accessory that has real appeal and we think you’ll agree when you read about it. You may also want to view the video that we’ve embedded for you below this story. Many of you will know that Kickstarter is a site dedicated to funding new product ideas, giving backers the chance to raise a target amount by the deadline in order to put a project into production. The SLiM Stand Like iMac is by Footmarker who set themselves a number of challenges for the stand. It had to have a simple design (inspired by the iMac), be simple to use and set up, and have an affordable price. It looks as though they’ve achieved all of that and in fact they have designed two different SLiMs, the SLiM for iPad (or other tablets that have a flat surface) and the SLiM-mini (for the iPad mini). The stand is sanded-anodized aluminum based, has an iMac style design, a hole for the cable so that it goes neatly through the back, and foam pads that attach the tablet or anchor it on the desk. It’s said to be strong with no wobble or shake, and if it stands up to these claims we think it’s something that could attract a lot of buyers. The short demo video below shows how easy it is to use the stand. At the time of writing a total of $5,162 has been raised from a target of $14,000 and there are still 20 days to go until the deadline. You may also be interested in two other Kickstarter projects for Apple devices, the iPhone 5 Craftwerk Aluminum case and the iPhone FUMM universal mount accessory. 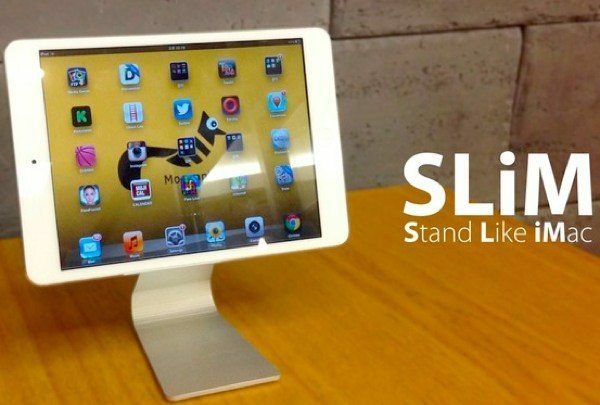 We’d like to know what you think about the SLiM stand for iPad. Does this accessory appeal to you? Maybe you’ll be backing the project yourself? Let us have your comments on this. Vitality is also the main key while presenting any information in a article.People would definitely like this and give positive response to it.Nice one truly. Superb kind of work by the author as this particular topic needs more precise information and special attention to it.Thanks a lot.